The Audi e-tron in front of the Villa Reitzenstein: Winfried Kretschmann, Minister-President of Germany’s federal state of Baden-Württemberg, and the Audi CEO, Bram Schot, met for an informal exchange of opinions at the headquarters of the state government in Stuttgart. On this occasion, the Chairman of the Audi Board of Management accompanied by Wendelin Göbel, Member of the Board of Management for Human Resources, and Rolf Klotz, Chairman of the Labor Council of the Audi plant in Neckarsulm, handed over the keys of an Audi e-tron, which the Minister-President will test drive. The Audi e-tron is the first purely electric large-scale production model from the Ingolstadt-based premium car manufacturer and has attracted particular attention from the state government of Baden-Württemberg. The E-SUV for the Minister-President comes from Audi’s CO₂-neutral production facility in Brussels. It is a “myth-black” Audi e-tron advanced 55 quattro (electricity consumption combined in kWh/100 km*: 26.2-22.6 (WLTP); 24.6-23.7 (NEDC); CO₂ emissions combined in g/km: 0). The Baden-Württemberg Ministry of Transport will also shortly take over two Audi e-tron models for test drives. “At Audi, the Audi e-tron represents the new era of electrification and digital services. We are delighted that the Minister-President of Baden-Württemberg is enthusiastic about the Audi e-tron,” said Audi CEO Bram Schot. “In September last year, Minister-President Kretschmann was able to take a close look at the E-SUV at its world premiere in San Francisco, and now he will test drive it,” said Schot. With a fleet of 50 Audi e-tron shuttle vehicles, the company was already able to demonstrate the practical capabilities of the E-SUV in the Swiss mountains at the World Economic Forum in Davos this January. The first deliveries to European customers will start in March; more than 20,000 customers worldwide have already made advance reservations for the model. Schot: “We intend to electrify all our model ranges and make all our plants CO₂-neutral by 2030.” By 2025, Audi will offer twelve cars with all-electric drive in the most important markets worldwide, and will generate about one third of its unit sales with electrified models. Production of the Audi e-tron Sportback will start at the Brussels plant before the end of this year. 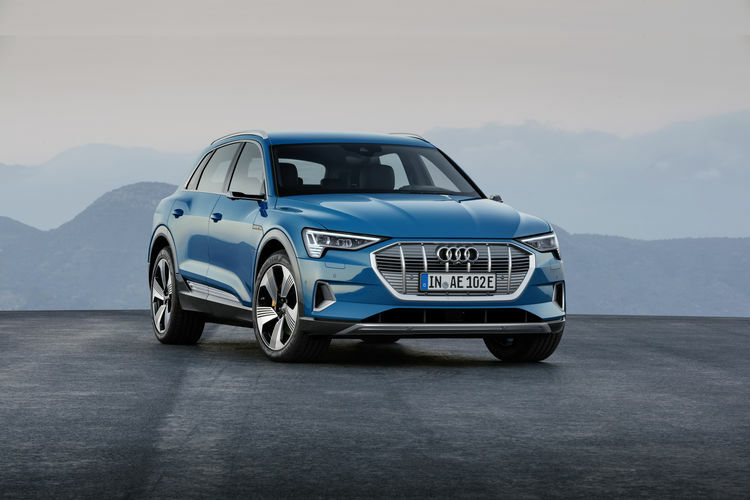 In 2020, the Audi e-tron GT will follow from the Böllinger Höfe factory at the Audi site in Neckarsulm. The company also intends to use fuel-cell technology in the future. The competences for the Group are combined at the Audi site in Neckarsulm, Baden-Württemberg. The sustainability of the Audi e-tron has its origins already at the production site in Brussels, the world’s first large-scale production in the premium segment certified as CO₂-neutral. The Audi plant in Belgium has achieved this pioneering achievement with three measures – green electricity, ecological heat supply and climate compensation projects. Essential for the Audi e-tron is its overall concept of sustainable production, locally CO₂-neutral driving and reliable charging. A 95-kWh high-voltage battery is the basis for a range of more than 400 kilometers in the WLTP driving cycle. This is made possible above all by the innovative energy recuperation system, which contributes up to 30 percent to the car’s range. The sophisticated aerodynamics are also decisive for the high efficiency of the Audi e-tron. One of the technical highlights is the option of virtual exterior mirrors – a world innovation for a series-produced automobile. The two electric motors of the luxury-class SUV deliver up to 300 kW and, in combination with the electric all-wheel drive, ensure optimum performance on any terrain. On long journeys, on holiday for example, customers can charge the e-tron with up to 150 kW direct current (DC) at fast-charging stations – the first series-produced car to offer this option. Coupled with a complete charging offer for the home, customers can drive purely electrically without having to make any compromises.